I teach Choy Lay Fut Kung-Fu and Self Defense Jiu Jitsu Basics. Our Choy Lay Fut Kung-Fu style is a great way to get stronger. We get stronger with body, with mind, and with spirit. Our physical structure is developed progressively, with attention to details. Our mental strength is developed by having to work our brain with our body as one - there are steps to remember, and discipline and motivation and perseverance to be developed for practicing. The spirit gets strengthened as well, by practicing putting our whole being into our techniques. It's one thing to mechanically do the moves. It's a whole other universe when you tap into your emotions, and put character and expression into your techniques. The combined strength of body, mind, and spirit elevates our sense of self, and improves our confidence and belief in ourselves. Our Self Defense Jiu Jitsu Basics is our self defense methodology. We generally get involved with the martial arts because of the idea of self defense. 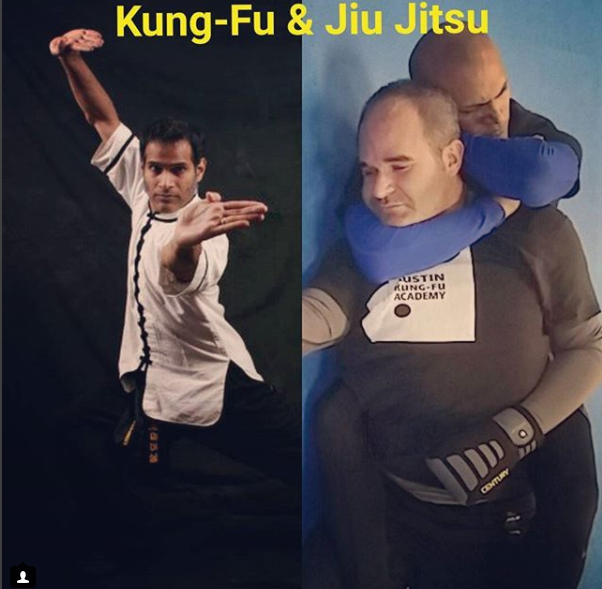 While our Kung-Fu is wonderful as strengthening our body, mind, and spirit, our Self Defense Jiu Jitsu basics gives us the best strategy for staying safe in a violent confrontation. We want your first level response to threatening situations to default to the Self Defense Jiu Jitsu basics. NOTE: WE DO NOT DO SPORTS JIU JITSU. This is purely the basics of self defense, be it a street fighting situation, a bullying situation, or a sexual assault. We use the principles of leverage, timing, distance management, energy efficiency, and natural body mechanics. Someone might ask, "Why not train Kung-Fu combat for self defense?" The issue here is that Kung-Fu is a striking based art, mostly. If someone is bigger, stronger, heavier, more aggressive, more athletic than you, striking might not be the best option. Kung-Fu self defense strategies relies a lot on athleticism, and has an unscalable strategy, which is to land strikes. The problem is when you are in the range to land strikes, you are also in the range to RECEIVE strikes, does this make sense? Striking can work, but there are far fewer guarantees in trading punches and kicks as a means to keep you safe, as opposed to Self Defense Jiu Jitsu Basics, where the emphasis is to control the opponent, exhaust them, then submit them. This is a much more effective and scalable strategy. For example, someone who attacks you who you might know, you might not want to destroy them with strikes. You might be better off escaping from their grip through leverage mechanics, and control their motions through positioning, and submissions. That being said, we do strike in Self Defense Jiu Jitsu Basics, but it is strategic striking to improve our control and our position. I would love for all of my students to get holistically stronger through Choy Lay Fut Kung-Fu, and have Self Defense Jiu Jitsu basics as their combat default in violent situations. I've found that the two arts can very successfully co-exist in one person. We are quite a unique martial arts school in Austin, TX with this kind of focus! I hope you' join us in this journey. Newer PostThe Art of Making Mistakes & Escape A Single Handed Shirt Grab Against the Wall! Older PostTime To Learn a Kung-Fu Broad Sword Combo!